Includes posing by Serge Nubret, Bertil Fox, Kal Szkalak, Tom Platz, Shigeru Sugita, Kozo Sudo and many more great stars. These are Classic Contests from 1976 starring the greatest bodybuilders in the World from that period. 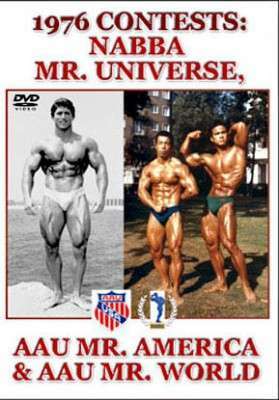 Includes posing by Serge Nubret, Bertil Fox, Kal Szkalak, Tom Platz, Shigeru Sugita, Kozo Sudo and many more great stars. These are Classic Contests from 1976 starring the greatest bodybuilders in the World from that period. See many of these great champions listed below. Obviously not every person listed in the RESULTS BELOW is shown, as this was shot on silent film and digitally converted to DVD. Background music added. COVER PHOTOS above from left to right starting on the REAR: Bertil Fox, Clint Beyerle, Chris Dickerson, Serge Nubret – FRONT: Kal Szkalak, Shigeru Sugita and Kozo Sudo. All photos above by Wayne Gallasch, apart from Kal Szkalak, and all were taken around the time of the various contests. The photo of Sugita and Sudo was taken the day after they were winners at the 1976 NABBA Universe.